Union Coop has always been very particular when it comes to value-for-money promotions and taking the feedback of their valuable customers after every promotional campaign. After the phenomenal success of Union Coop’s first ‘Final Reduction’ promotion, the company announced a close sequel which will offer customers up to 90 percent discount on 1000 plus products. The promotion will be exclusively for ‘Tamayaz Card’ holders and will start from 1:00 PM to 1:00 AM, on July 5th Thursday. Union Coop received positive reviews and a tremendous customer response in its previous campaign, wherein they got repeated requests for increasing the time and a feedback on specific brands majorly sought by the customers. 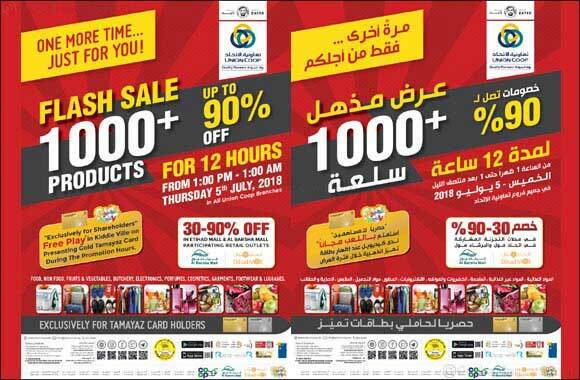 This upcoming Flash Sale is a response to all the feedbacks and suggestions of the customers, who not only have the opportunity to lay their hands of one of a kind deals but earning extra points while shopping with their Tamayaz Card. For those few who do not have a Tamayaz Card can easily get one by contacting the Consumer Happiness section at any of the Union Coop branch for FREE. Customers will be able to enjoy this promotion in all Union Coop Branches and Malls and will include categories of– Food, Non-Food, Fruits & Vegetables, Butchery, Electronics, Perfumes, Cosmetics, Garments, Footwear and Luggage. Along with the promotion, visitors at Union Coop – Mirdif Branch, Etihad Mall will be able to attend a very happening event that will see notable actors and social media influencers talk about their own Union Coop experience. The event will be at 5:00 PM at the Union Coop – Mirdif Branch, Etihad Mall, Gate No 2, and will be attended by Mr. Abdullah Rashid Al Shehhi, fondly known as Abo Abed, Mr. Abdullah Al-Jafali - a popular artist and social media personality, Mr. Abbas Fardullah - Media and Events personality, Talented artist Ms. Razeka Taresh and Fares Al Amir, Actor and Director and Event Organizer, Popular film actor Nora Saif, Asma Al Mazmi – social media activist and Social Media Influencer Laila Rahal.